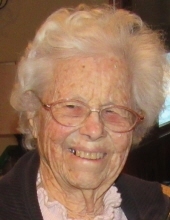 Eileen R. Walls, 93, of Port Clinton, OH, passed away, Monday, February 04, 2019, at Edgewood Manor Nursing Center. Eileen was born on June 05, 1925 in Fremont, OH, the daughter of Tom and Esther (Feightner) Cooley. She graduated from Fremont Ross High School in 1943. On July 04, 1947 in Port Clinton, she married Robert J. Walls and he survives. Eileen worked at Standard Products in the 1940’s and early 1950’s, then was a housewife. She bowled in the coffee leagues at Harbor Lanes for many years, was an avid hunter in Wyoming and loved spending time with her grandkids. Those left to cherish her memory are: Loving Husband of 71 years: Robert J. Walls of Port Clinton; Sons: Robert T. (Kathy) Walls of Port Clinton and Larry (Paula) Walls of Castalia; 4 Grandchildren; 2 Great-Grandchildren and several Nieces and Nephews. Eileen was preceded in death by her parents, twin sister: Kate (Delbert) Long and sister: Jackie Bower. Services will be private. Interment will be in Riverview Cemetery, Port Clinton, OH. In lieu of flowers, memorial contributions may be given to Stein Hospice, 1200 Sycamore Line, Sandusky, OH 44870 or to a charity of the donor’s choice. Gerner-Wolf-Walker Funeral Home & Crematory, Port Clinton, OH has assisted the family with arrangements. To send flowers or a remembrance gift to the family of Eileen R. Walls, please visit our Tribute Store. "Email Address" would like to share the life celebration of Eileen R. Walls. Click on the "link" to go to share a favorite memory or leave a condolence message for the family.